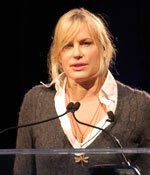 Actress and activist Daryl Hannah has been a fixture at the National Biodiesel Conference since the very beginning and one of her major areas of interest when it comes to renewable fuels and the environmental is sustainability, so she was thrilled with the sustainable theme during today’s general session at the conference. Daryl says she takes time every year to come to this conference because biodiesel is such an important part and can be such an amazing player in creating a self-sufficient world. “It holds the promise of a sane reality and a liveable world and I want it to fulfill that dream so desperately and that’s why I come to say it can be done,” she said.